Baker Victory Services in Lackawanna is using ‘groundbreaking’ treatment for children with duel diagnosed behavioral and medical challenges. WBFO’s senior reporter Eileen Buckley tells us this is a ‘first of its kind’ program in New York State. Cindy Lee, Chief Clinical Officer, Melody Smith, Director of Intensive Treatment Program & Terese Scofidio, Baker Victory Services CEO. “To serve what is one of the most difficult populations to serve. 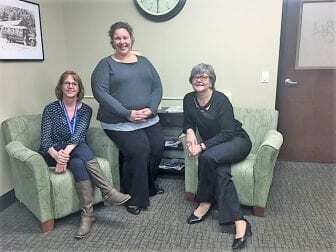 Young children who have significant intellectual disabilities as well as significant behavioral health challenges,” said Terese Scofidio, CEO, Baker Victory Services. Baker Victory Services is known for its legacy of providing children and families with a variety of services and residential programs. Scofidio tells WBFO News they currently care for more than 3,600 adolescents. They have physical and mental health challenges and disabilities. Baker Victory is now teaming with several agencies. The State Office of Mental Health, State Education Department, Office of Persons with Development Disabilities, Dr. Michael Cummings at ECMC and the Buffalo Psychiatric Center to provide the Intensive Therapeutic Program. “It requires intensive one on one staffing, it requires highly trained and skill staff, which is why it has never been done before,” Scofidio explained. “How did that come to be – that you got this first of its kind?” asked Buckley. “We have our residential treatment facility, which is a subacute inpatient psychiatric facility for teenagers with significant mental health issues. We are working with the state, and as residential programs decrease and the need for beds decrease, we are going to more outpatient, more natural setting treatments. We had vacancies available. They knew we have a lot of behavioral health, both in our outpatient programs and our schools, so we began a dialogue well over three years ago,” responded Scofidio. A team of professional with expertise in psychiatry, clinical social worker and those mental health training make up the program. Children, ages 12 to 17-years-old, who may have autism, an intellectual disability and mental illness, are getting help. “We are seeing an increase in the needs of the population that we are serving,” remarked Cindy Lee, Chief Clinical Officer, Baker Victory. This local program is serving children all across New York State. “We had a conversation the other day that the community that Baker Victory Services supported 30-years ago isn’t the community that we are supporting anymore. The needs are more intense. Families are more destabilized and we are looking more at wrapping services around families rather than just individuals. This program, in particular, is unique because many of the children that we are supporting, also have low cognitive ability,” said Lee. This is a ‘short-term’ program where the average stay is three to six months. “We’re not looking at as what people think is fixing a kid. This is building the tolls that are life-long,” commented Melody Smith, Director of the Intensive Treatment Program. Smith navigates us through the treatment concepts. “We look at the maladaptive behaviors and then we replace those problem behaviors with functional skills, but then we do for that mental health piece also is look at general coping skills, because it’s not always the same function, so we have to look at that. We also look at their speech, their O.T. (Occupational Therapy) and their P.T. (Physical Therapy), so we have to look at the whole picture instead of just saying its problem behavior and look at the whole child,” replied Smith. Even the simplest of outings are a part of the program like a stop for ice cream or fast food. “And Melody’s already had them out for a field trip to Dairy Queen, which is a true success for these kids, because they’ve have not been out like that,” noted Scofidio. “You and I might think a trip to McDonald’s is nothing, but for that family it is something huge. So not only are we working on those functional skills, but also that community integration,” said Smith. “Not just look at the youth that we serve as a behavioral problem. Why is there behavior manifesting the way that it is and giving them other halter ways because angry is a real emotion and we all feel it, so there’s no shame in being angry about something, but you can’t punch somebody in the face just because you’re angry. What are the other ways they can learn to express their frustration, sadness, anger,” said Lee. The goal of the intensive therapeutic program is for the child to successfully re-enter back into their lives, allowing them to reach into their new ‘tool kit’ for social and emotional behavioral stability.